Are you trying to drive legally in California? If that's the case, you must apply for your new CA driver's license. The CA DMV is there to help people get their California driver's license. You can be a brand new first time driver, a new resident in the state, or a legal non-citizen. You can find the information for each case below or here for applying for a new license for teens. 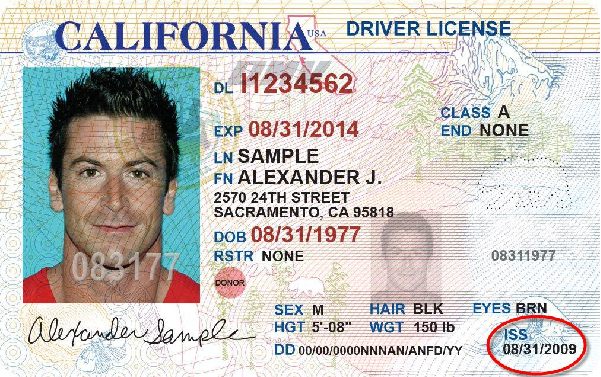 If you are a California resident but can't give proof of U.S. legal presence, there will be a way for you to obtain a California driver's license. This law will be effective starting in the beginning of 2015. Check here periodically to find out about the most recent updates and what documents you will need to get an AB 60 license. Once you have established residency in the state, you need to apply for your CA driver's license in 10 days or less. Also see how to get your California ID cards. Paying tuition for a California college. Applying for property tax exemption for homeowners. For those who have never held a driver's license before, you will receive your permit after passing your written permit exam. At that point you can begin practicing for your road driving test. If you have held a driver's license before, you may skip the section about the learner's permit. NOTE: Waived tests are decided by the CA DMV, so you should be prepared to take one if it comes to it. Class C - With this license, you can operate regular, noncommercial passenger vehicles. Non-commercial Class A - This license is for those who operate noncommercial travel trailers that weigh over 10,000 pounds, fifth-wheel travel trailers over 15,000 pounds, and livestock trailers between the weight of 10,000 pounds and 15,000 pounds. Non-commercial Class B - With this driver's license, you may drive a motor home or RV 45 feet or less in length. Goes over California's GDL program, which includes driver's ed requirements, provisional licenses, and provisional permits. You can get an M1 and M2 motorcycle license in California. Figure out how you can obtain a Class A, B, or C commercial driver's licenses (CDL). You'll also find information about adding endorsements. You've been a California resident for a while and have never had a license. Apply to get a CA driver's license. You are in the U.S. legally. If you have a diplomatic driver's license from the U.S. Department of State, you don't need to get a new CA driver's license. You're over 18 years old and just visiting California with an out-of-state license. You're an active member of the military or you're a dependent stationed in CA. This applies if you have a valid out-of-state license and are not a resident of California. You drive farm vehicles off of public roads. You only drive off-highway vehicles and/or snowmobiles without going on public roads (except to cross). If you've never held a Class C or Non-commercial Class A or B license in California, you will need to get a learner's permit first. "Applying for a California Driver's License" below provides more information on getting your learner's permit. Making an appointment with your DMV to take the written and vision exams. You should make an appointment before 4:30p.m. Completing the Driver's License or Identification Card Application (Form DL 44). You cannot find this form online. You must get one at the DMV or call the automated DMV number at (800) 777-0133 to get one in the mail. Marriage certificate and/or proof of a domestic partnership formation. Paying the fee of $33. Passing your written permit test. This test contains 36 questions about traffic laws and road signs, and you will have three chances to pass. You may take this practice test to prepare yourself for the test. Now, once you have passed the written test, you will be issued a learner's permit by the CA DMV. You may use this permit for practicing for the permit test. For practicing, you must be with a licensed driver who has the same license class and is over the age of 18. There is no required amount of time that you must have your learner's permit. For those who think they are ready, they may even schedule their test on the day after getting their permit. You've got to make an appointment with your local DMV. Tests MUST be done at the DMV. You will have three chances to pass your driving test. You don't have to wait a minimum period of time between driving test attempts, but you must make a new appointment for each one. Your first attempt at the test is part of the application fee, but every attempt after the first is a $6 fee. You will need to fill out a Commercial Driver's License Application (Form DL 44C). You will have to get the form either at the DMV or through the mail by calling (800) 777-0133. It is not online. You will pay a fee of $34. Schedule a meeting with your local CDL office. Bring along your Noncommercial Class A or B vehicle. You are not allowed to work in the U.S. or are ineligible otherwise. You can show a valid birth date and/or legal presence (BD/LP) paper. Your date of birth/legal presence (BD/LP) papers. These papers show you date of birth and legal presence in the U.S. This document is certified by the DMV with the United States Citizenship and Immigration Services (USCIS). Over 30 days from the day you have applied for a driver's license, the application process will go ahead as expected. Less than 60 days from the date you applied for your driver's license, you are allowed to take your tests, but you will not get a driver's license with your photo on it until you are able to show another BD/LP document that is valid for 60 or more days from your date of applying. Limited Term (LT) driver's license in the case of your BD/LP expiring less than five years from your license application date. Full driver's license in the case that your BD/LP expires over five years from your license application date. NOTE: To reiterate, you will not need a new CA driver's license if you have a valid diplomatic driver's license from the U.S. Department of State. It is however, essential to to keep up with your California License Renewals at all times.